Geraniums are one of the most loved garden plants because of their low maintenance, long bloom time and variety of flower and foliage color. Although they are hardy only in U.S. hardiness zones 10-11, geraniums are commonly grown as annuals in cooler climates. 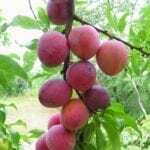 They can even be taken indoors and grown as houseplants through cold winter months. Geraniums are generally low maintenance and easy to grow but, like any plant, they can experience some problems. One of the most common includes geranium leaves turning red. Continue reading to learn more about afflictions that can lead to red leaves on geraniums. Why are My Geranium Leaves Red? Red leaves on a geranium is a sign that the plant is stressed in some way. While the bright red coloration of stressed geraniums can actually be quite attractive, it is a sign for concern. Red geranium leaves can be a symptom of minor problems, such as over or under watering, nutrient decencies or cool temperatures. However, geranium leaves turning red can also signify more serious issues. The most common reason for red leaves on a geranium is cool temperatures. This may happen in spring or fall when these heat-loving plants become shocked by fluctuating temperatures and cold night time temps. In spring, this problem will often work itself out as temperatures begin to warm up. However, container grown geraniums may need to be taken indoors when low temperatures are expected and geraniums in beds may need to be covered. In autumn, geraniums with red leaves can be left for added fall color. However, if you wish to overwinter geraniums, you should pick off the red leaves and move the plant indoors. When cool temperatures are not the cause of red leaves on a geranium, it may be time to think about your watering habits. Geranium plants have low water needs and red geranium leaves oftentimes are caused by overwatering. Geraniums may also produce red leaves from too little watering. Therefore, it is important to pay attention to the weather and timing of red leaves. If it is a cooler period like spring or fall, the fluctuations of temperature may be the problem. If it is a specifically rainy period or time of drought, water may be causing red geranium leaves. Lack of magnesium or phosphorus can also cause red leaves on a geranium. It is recommended that geraniums be fertilized every 7-14 days with a foliar fertilizer for flowering plants or vegetables. The fertilizer’s ideal NPK ratio should be 5-15-15 or 4-10-10. Another deficiency that can cause red leaves on a geranium is low pH. The ideal pH for geraniums is 6.5. If you have ruled out temperature, watering or fertilizing issues as a cause for red leaves, it may be a good idea to test your soil pH. A fungal disease known as geranium leaf rust can cause red or brown lesions to form on the undersides of geranium leaves. This disease is caused by the fungus Puccinia pelargonium-zonalis. Many geranium hybrids are resistant to this condition. The symptoms are mainly red to brown lesions or rings on the underside of foliage and powdery red to brown pores covering the underside of foliage as the disease progresses. 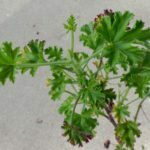 This disease does not cause entire geranium leaves to turn a bright red, so it is easy to distinguish between geranium leaf rust and common afflictions which cause red leaves on a geranium.